Add a unique colorful dimension to your music listening experience! 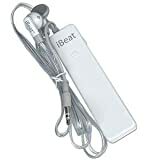 These iBeat Illuminating Headphones literally brings the music to light! These eye-catching earbuds glows in an Acid Aqua color and delivers impressive sound quality to your ears! Perfect for your iPod or other MP3 Digital Audio Player with a 3.5 mm stereo connection! The EL-Illuminated headphone wires can either flash and blink to the beat of your music or provide a steady neon glow. Includes plastic belt clips that securely holds your iPod, iPod Nano, iPod Mini or iPod Shuffle! Get this for your next iPod party and enhance your musical experience!